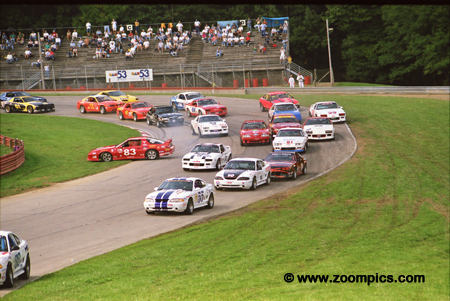 The 2001 Runoffs took place at the Mid-Ohio Sports Car Course - this was the eighth consecutive year the event was held at this track. Twenty-four races would determine the Sports Car Club of America's National Champions. The event was moved to the third week of September from the traditional October date to avoid conflicts with other race series. An additional benefit to the rescheduling came in the form of the weather - although it rained for some of Friday's races it was much warmer and sunny on Saturday and Sunday. 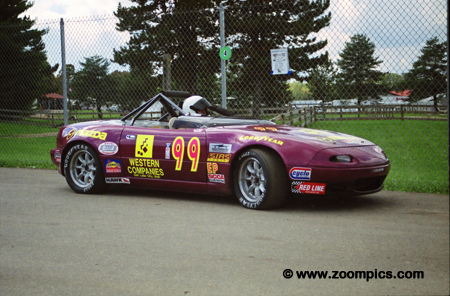 John Fergus and his Carbir CS2 were the odds on favourite to win the Sports 2000 title. 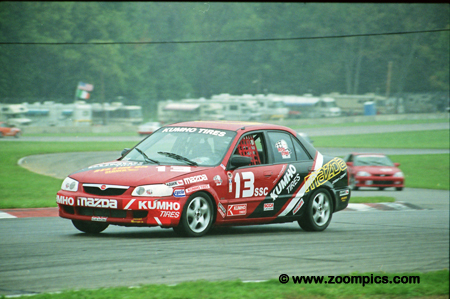 In addition to being the 1999 class champion, he had won five Sports 2000 races at Mid-Ohio in 2001. He was the fastest qualifier and led 'flag to flag' to score a 5.218-second victory over Mark Hardymon in a Lola T91/90. Thirty-nine E Production competitors made it through the first corner without incident. Pole-sitter Pratt Cole in the No. 99 Mazda Miata led from start to finish. Beside him is the second fastest qualifier Grayson Upchurch in a Nissan 240SX. Immediately behind them is, 1999 E Production National Champion, Bob Endicott in the No. 9 Honda Prelude. Spec Racer Ford competitor Richard Spicer qualified on the pole, however, he fell to third early in the race. Spicer was able to move back out front for laps three through seven but was not able to make it stick until lap fifteen. He led the race from that point on and took the national title by 1.456-seconds. Pole sitter Wolfgang Maike in the No. 15 Toyota Paseo led laps one through eleven but fell back to fourth when he went off the race line in the “Keyhole” while encountering lapped traffic. He continued in fourth and was able to slip under third place Michael Cyphert's No. 76 Toyota Celica on the last lap when Cyphert's engine dropped a cylinder. 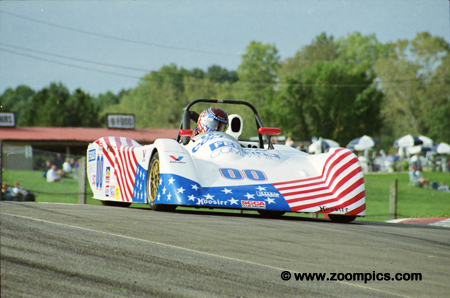 Duane Davis earned his eleventh National Championship at 2001 Runoffs. Davis won his first title in 1985 and had earned gold medals in GT2, GT4 and GT5. A majority of his championships were in GT2 – 2001 would be his sixth. He started from the pole but at the start dropped to second. With the retirement of leader, Tom Patton’s Sunbeam Davis led the final 7-laps and finished 5.2309-seconds in front a hard charging David Finch. Joe Huffaker in the No. 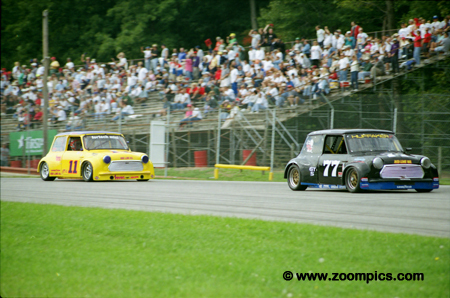 77 Huffaker Mini leads the No. 11 Fortech Mini Cooper of Doug Peterson. Huffaker and Peterson started behind pole sitter Jimmy Burke driving a Nissan 200SX. The three ran in close quarters until lap-6 when Burke was slowed by a lapped car. Huffaker and Peterson slipped by and would run in this order to the checker. This was Huffaker’s second title of the weekend – he won F Production on Friday. Friday’s weather conditions were unpredictable which made it difficult for competitors to choose the correct set-up. It had stopped raining just before the start of the Showroom Stock C race. Teams had to choose between a dry or wet option. Local racer David Roush selected freshly shaved tires. It appeared that Roush had been making the right decisions all week. He qualified first and led every lap to win by 18.210-seconds. Bob Urso in the No. 19 Decker MK ½ leads the Beasley Decker of Al Beasley Jr. during D Sports Racer qualifying. Urso started twenty-fifth - last in the class but would finish fifteenth. 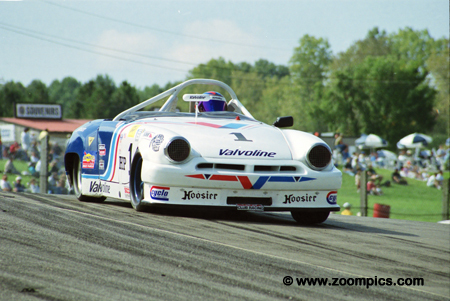 Beasley, the 2000 D Sports National Champion, qualified third but retired with a CV-joint issue. 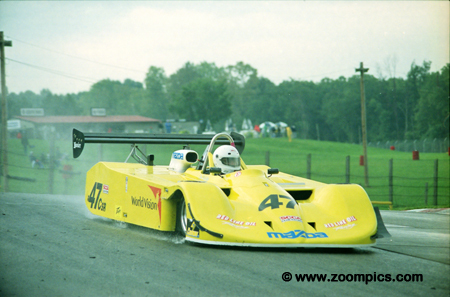 The class was won by Marc Hoover driving a Mazda Cheetah. Ron Bartell, the defending H Production Champion, had things well under control from the beginning of the event. He qualified on the pole during the first session and was almost a second faster than the next car which was driven by Brian Linn. The driver of the No. 1 MG Midget led every lap of the race. 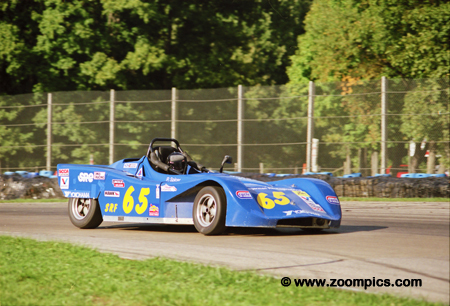 One of the more controversial cars at the 2001 Runoffs was the C Sports Racer of Jacek Mucha. 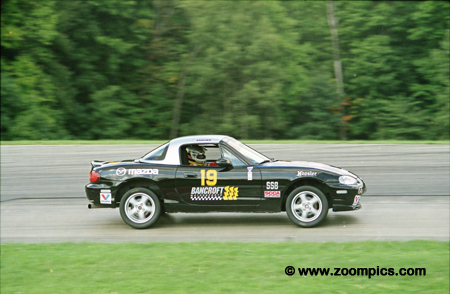 He qualified and finished second in his Beasley B-2 powered Mazda. But after the race, he was moved to the last finishing position (seventh) for a non-compliant floor pan. Jamie Houseman started the GT4 race from third and ran in that position until lap-4 when pole sitter Wilson Wright Jr. retired. Houseman followed race leader, Scott Culbertson, until lap-10 when he able to make a pass under braking. 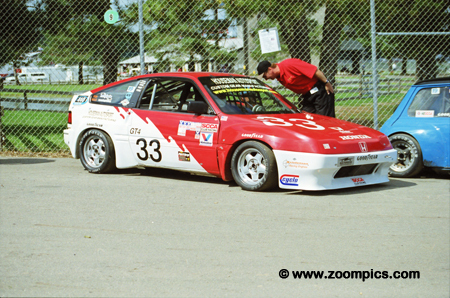 The Honda CRX driver was challenged by Culbertson but held on to win his third National Championship. 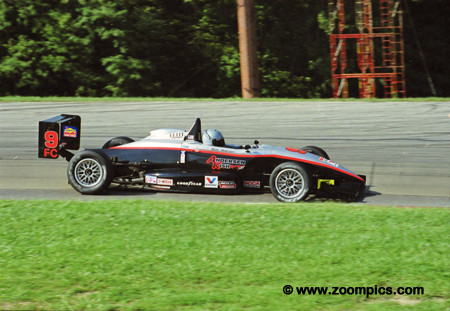 After sitting out 2000, 1998 and 1999 C Sports Racer National Champion, Ben Beasley returned to competition. Beasley started from the pole in his Beasley B-7 but was passed by Michael Vergers on the first lap. By lap-2, he was back out front and put the experience of competing in the rain at Mid-Ohio to good use by taking the victory. The only time a third win appeared to be at risk was a black flag he received mid-race for a sound violation. 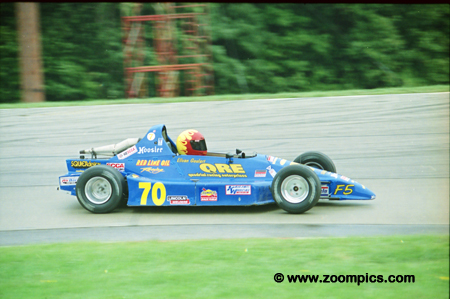 1998 Formula Vee National Champion Brad Stout won his second title at the 2001 Runoffs. Stout dominated one of the clubs most competitive classes. He started from the pole, led every lap, recorded the fastest race lap and won by a margin of 11.925-seconds. 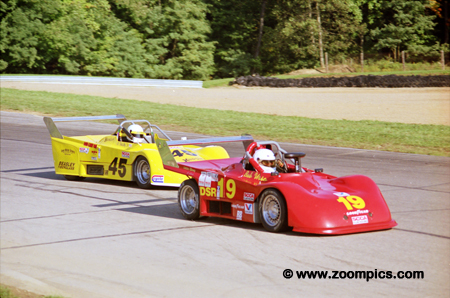 Finishing second was Roger Siebenaler in a Mysterian M2 and Stephen Oseth took the final spot on the podium. In the F Production race on Saturday, Mark Weber notched up Runoffs start twenty-eight which was over halfway to his goal of starting fifty Runoff races. He qualified eighteenth and finished eighth. The Austin Healey Sprite driver also entered G Production where he placed eighteenth after starting thirteenth. The No. 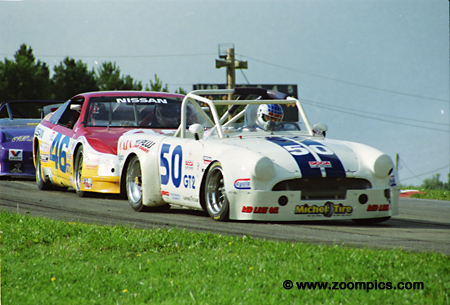 50 Sunbeam Tiger of Tom Patton qualified fourth in GT2 while James Goughary in the No. 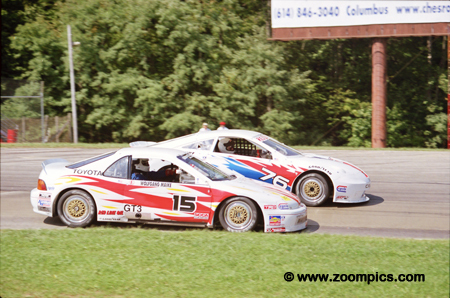 46 Nissan 300ZX started second. Patton used the power of the Ford V8 engine to jump into the lead at the start. He led the first twelve laps but retired with a broken axle. Fuel pickup problems caused Goughary to retire. At the start of the Touring 2 race second place qualifier, Mark Sandridge, was hit by the BMW of Doug Gamble. In turn, Sandridge’s Porsche collected the Camaro of pole-sitter Tom Oates. The ensuing mayhem allowed the No. 12 Ford Mustang of Brian Kelm to grab the lead but he was passed on the lap-5 by Gamble. Gamble was later penalized one minute for a restart infraction which gave the title to Kelm. Fourth-fastest qualifier Ken McVicker spun shortly after the American Sedan group took the starter's flag. 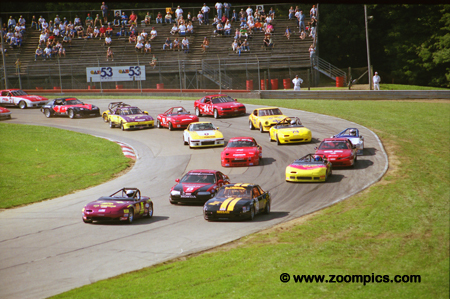 The thirty-nine car field avoided the local Chevrolet Camaro Z28 driver. He was able to continue but retired later in the race finishing well down the order. 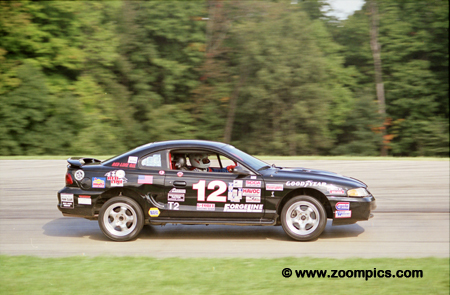 The championship was won by Andy McDermid in a Ford Mustang. 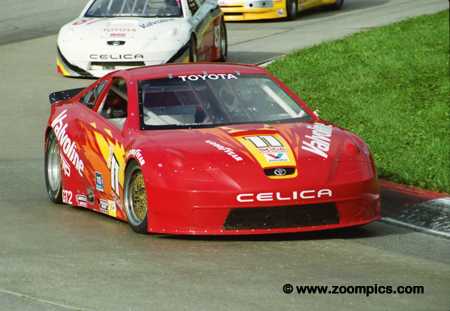 Three-time National GT3 Champion Pete Peterson qualified his Toyota Celica third. At the start, Peterson jumped to second place but a failed attempt for the lead on the first lap dropped him to fifth. He worked his way back to second and with just three laps left in the race made contact with leader John Saurino. Saurino got the worst of the incident and Peterson took the win and his fourth GT3 title. Larry Connor qualified second in his Ralt RT-41 but was able to take the lead on the second lap of the Formula Atlantic race. Connor appeared to have things well in hand until late in the contest. On lap eighteen of twenty, he had a problem with his left-rear upright. He was forced to slow down allowing second place, Keith Lively, to close within 0.129-seconds at the checker. Randy Saucier won his second consecutive Showroom Stock B National Championship. Saucier was the fastest qualifier and led 'flag to flag' winning by a 4.139-second margin. Pratt Cole took a two-year leave from racing and his fellow E Production competitors probably wished he had made it three. 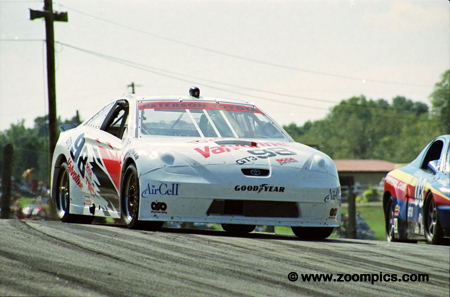 The 1997 champion was the fastest qualifier and led flag-to-flag. His lead never appeared to be at risk during the race and he finished 8.9289-seconds ahead of Grayson Upchurch in a Nissan 240SX. Heavy rain which ended just before the start of the G Production race meant drivers were faced with a difficult decision of selecting the right tires. There did not appear to be a consensus as there was a mix of rain, intermediate and dry tires on the grid. 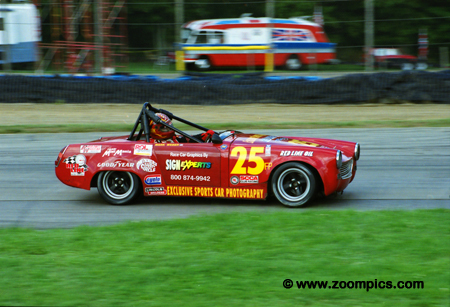 In the end, intermediates were the best choice as Datsun 510 driver Jeff Winter, who took the gold and second place Thomas Reichenbach used this type of tire. 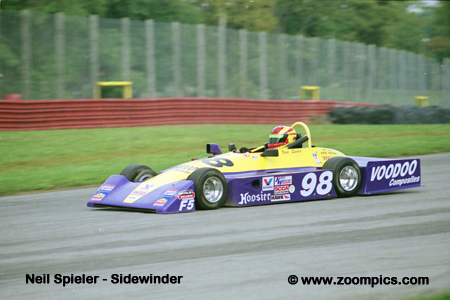 Kyle Krisiloff, son of former Indy car driver Steve Krisiloff, qualified fifth in the thirty-one Formula Ford field. The 17-year-old Krisiloff came well prepared for the Runoffs. In 2001, he entered twenty-one races in a car maintained by a former CART mechanic. 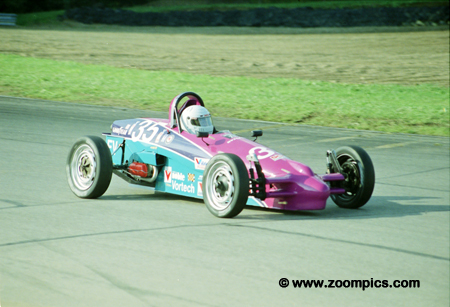 The Van Diemen driver passed pole sitter Keith Nunes on the ninth lap and never looked back to capture the National title. 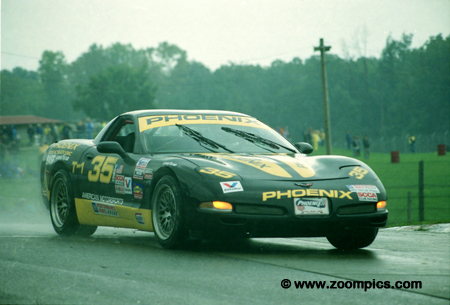 John Heinricy qualified second in Touring 1 driving the Phoenix Racing Chevrolet Corvette. 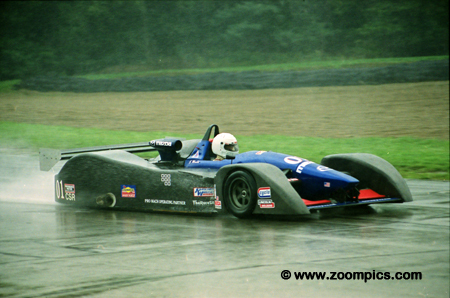 But during the very wet race Heinricy was second to no one. He did something that had never been accomplished in the history of the Runoffs - he lapped the entire field. 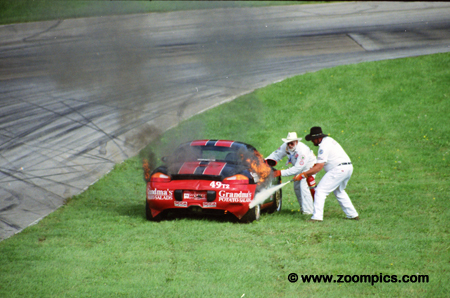 This was Heinricy’s second National Championship – his first was in 1993 driving a GT1 Corvette. The 2001 GT1 event appeared to be a repeat of the previous year’s race. 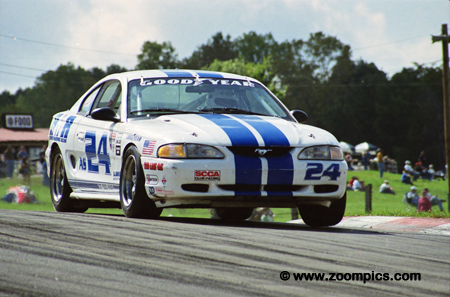 In 2000, Tim Cowen led much of the race only to lose the lead and championship to Jeff Ervin when his tires went off. Cowen had to settle for silver again as Ervin driving the No. 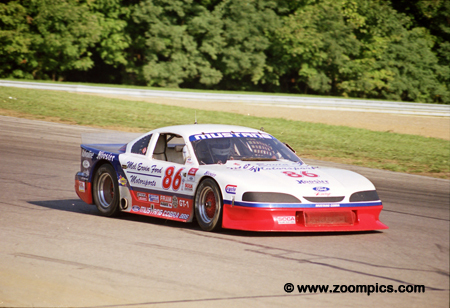 86 Ford Mustang passed him for the title with only 2-laps remaining in the race. Joe Huffaker in the No. 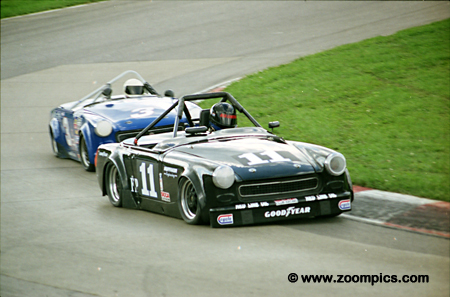 11 MG Midget and Rick Haynes in a similar model run nose to tail through the Esses. Fourth place qualifier Huffaker moved to the lead on the thirteenth lap and captured the F Production National Championship. Haynes spun off the track with brake problems and was classified twenty-fifth. The No. 70 Invader QC-1A of Elivan Goulart qualified second in Formula 500. Goulart took the lead at the start and held the position to the checker. Finishing behind him was Jeff Jorgenson driving a KBS MK5B and the Novakar J7B of Calvin Stewart. On the first lap of the Touring 2 race Doug Gamble in a BMW M3 ran in to the back of second place starter Mark Sandridge in the No. 49 Porsche Boxster. At the time Sandridge didn't realize that the exhaust system had been damaged. By the ninth lap he was overcome by exhaust fumes and the incident caused the car to catch fire. 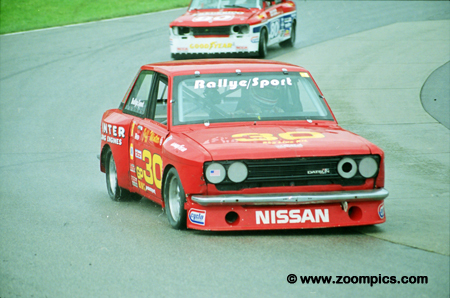 Andy McDermid dominated the American Sedan class. The Ford Mustang driver started from the pole and led flag-to-flag winning by an incredible margin of 30.856-seconds. The remaining podium positions produced a battle between Ross Murray, Kent Biddinger, Kelly Lubash, Richard Ciochon and Craig Weidner. In the end Ciochon finished second and third went to Lubash. 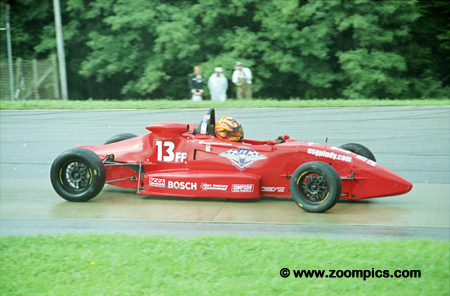 Driving a Van Diemen RF-00 Mike Anderson was the fastest qualifier in Formula Continental and led all laps to earn his second National Championship – his first was in 1999. 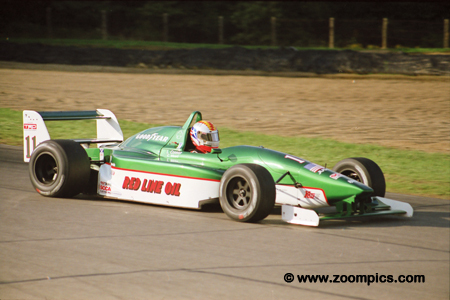 However, the race was not without drama as second and third place drivers - Arie Luyendyk Jr. and Dave Weitzenhof – were involved in a blocking and contact incident. 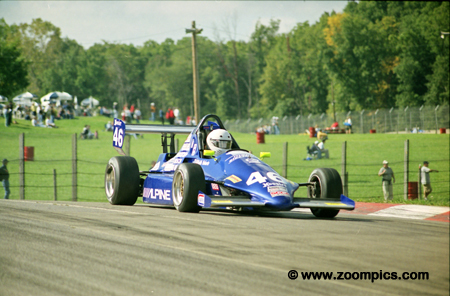 As a result, the finishing order was reversed - Weitzenhof was moved to second and Luyendyk classified third. Qualifying first and second in Formula Mazda were twin brothers Keith and Kevin Roberts. The brothers were separated by just 0.013-seconds – Keith, in the No. 46 Star Mazda, would start from the pole. While there was a lot of exciting racing behind the brothers they ran in formation. Keith would lead all 20-laps with Kevin finishing 3.1679-seconds behind.